The distance between Shillong and Dawki is 82 kilometers. Although these are narrow and winding roads, with several choke points where the traffic crawls, most cars would be able to do this run in about three hours or a little more. 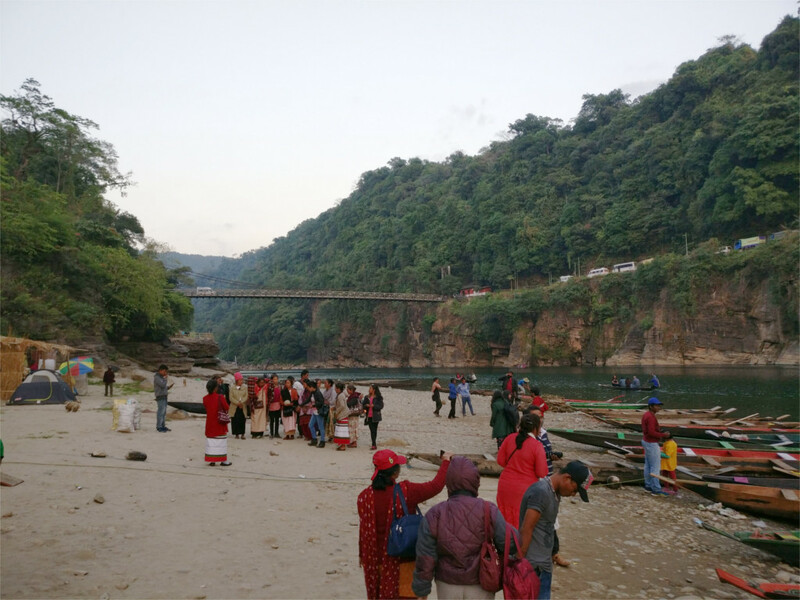 After starting from Shillong just before 9 in the morning, The Rath of the Clan reached Dawki as the sun was setting. 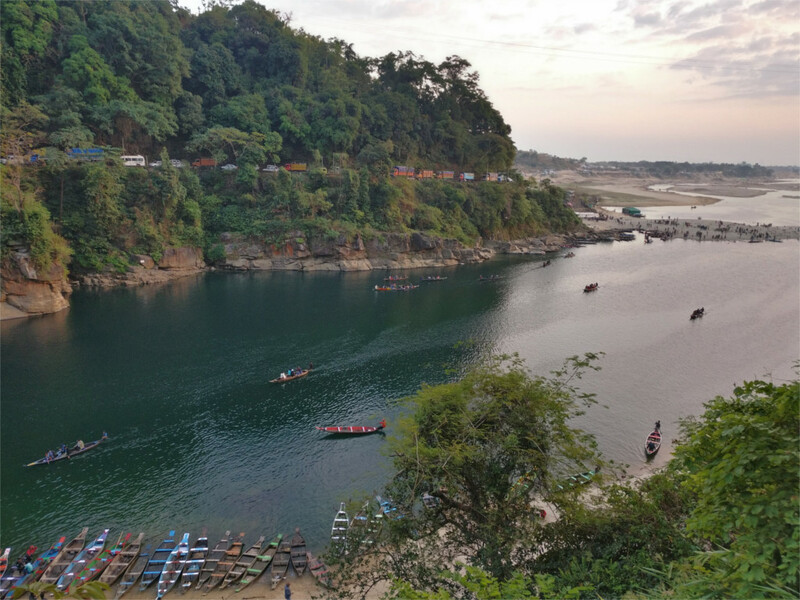 Dawki is the gateway through which a large fraction of the India-Bangladesh trade passes, since it sits on the Shillong-Sylhet highway. It is also a place where every tourist to Meghalaya wants to come. The result is that the narrow highway was completely jammed. Our driver wisely decided to stay far from the jam. We got off the bus and walked between unmoving trucks to get to what we wanted to see. The Goyain river makes a sharp bend here, and, according to the map I’d seen, all of the river belongs to Bangladesh. The Umngot river falls into the Goyain at the bend, and this river, as well as the bridge over it is in India. In fact, the northern bank of the Goyain belongs to India, as does Dawki town which lies on the far side of the bend, and across the bridge over Umngot. In the photo above, you can see trucks lined up after the bridge, waiting to pass through Dawki town and the border checkpost beyond it. 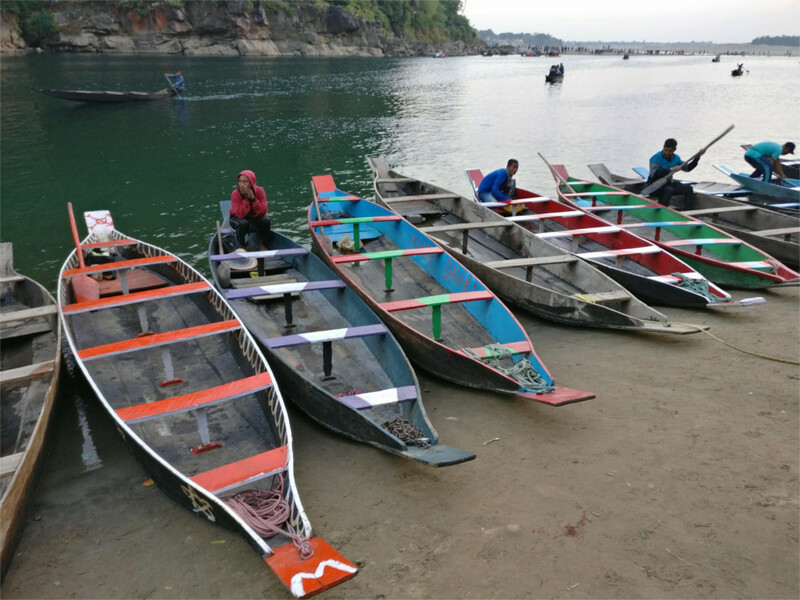 The boats drawn up on the bank belong to Indian boatmen who take tourists for a ride on the river. The Family and I hurried along to rough stairs cut into the cliff between the road and the river. This was immensely crowded and I was a little apprehensive about coming back up after the light faded even more. While planning this trip, The Family and I had thought of spending a quiet new year’s eve by ourselves in Dawki after the rest of the clan left. 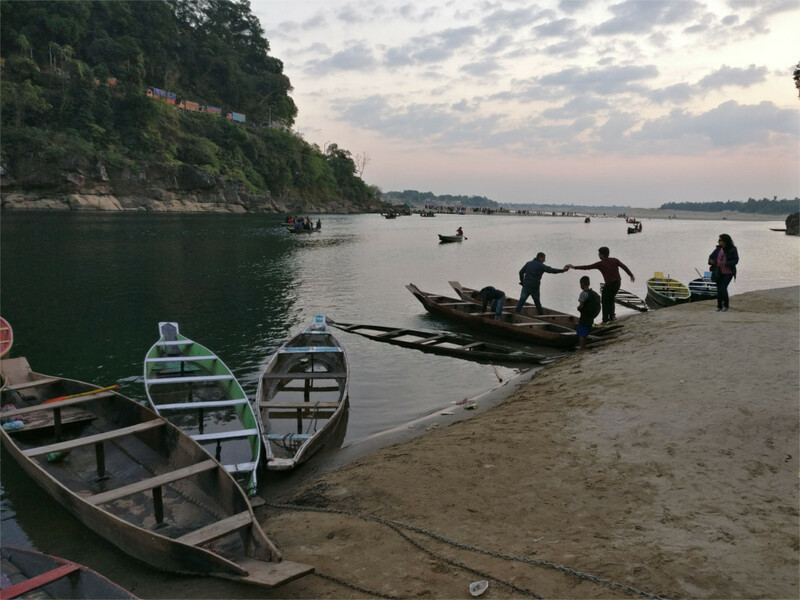 My idea was to spend a day boating on the Umngot and driving to the many waterfalls which make the leap from the Shillong plateau down to the plains of Bangladesh. But The Leafless was set on driving here with the rest of the clan, so we changed our plans. Unfortunately, we would have only half an hour at this place before it became dark. We climbed down and looked at the famous bridge over which so much of the Bangladesh trade passes (photo above). Did we want a boat ride? The rest of the clan had joined us by now, and we had a conference where eventually it was decided that we don’t. It was a nice place for a conference; I got a few good photos here. The river comes from the right, turns around at the bridge and flows down towards the center of the frame. 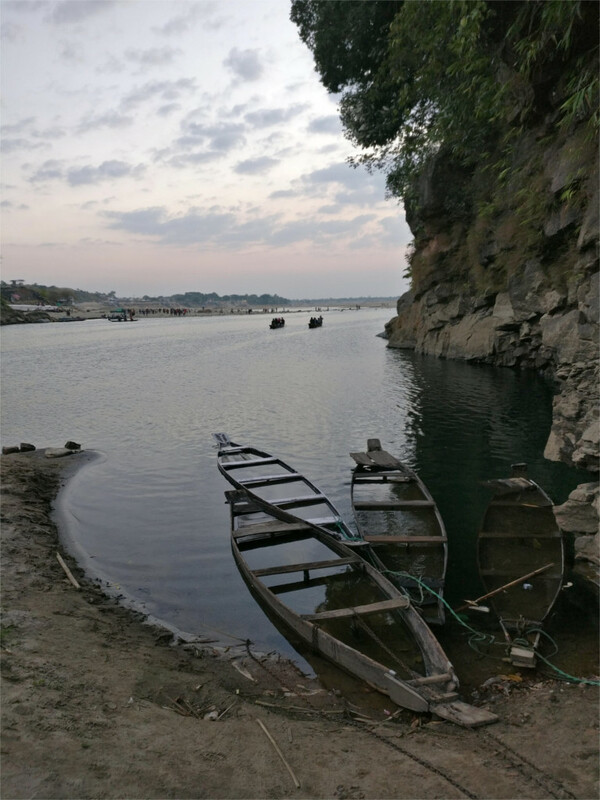 The far bank on the left is in India, and there is a barely visible channel between that and the far bank on the right, which is in Bangladesh. This “bank” is actually an island, chor in the local languages. The special geology of Meghalaya is apparent here. The Shillong plateau falls suddenly into the plains of Bangladesh, at a line of fracture called the Dawki fault. This part of the plateau is mainly clay and limestone, with very little visible igneous rock. I took a last photo of leaky boats settling into the water before turning to go. These boats are easy to build, and require constant bailing. As long as the wood is kept painted, they are usable. Lack of paint means that the boat has been given to the wind and water. The climb up to the road was now even more crowded with people coming down for a last look at the river before it became completely dark. Inexpensive internal tourism is clearly booming. I hope that this means that reasonable hotels will be available at a lower price in future. Join me in a moment of hope, Indian travel bloggers.